Periodontal disease develops when bacteria found in plaque and tartar accumulations infect the gum tissue. It can be prevented with proper oral hygiene habits, like brushing and flossing. Unfortunately, even with the best efforts, it can still occur. You may notice your gums are inflamed, red, or bleed when you brush your teeth. This is the first stage of the infection, known as gingivitis. Gingivitis can be treated quickly with a cleaning from your dentist and changes to your oral hygiene habits. Sadly, many people fail to recognize the early signs of the infection, allowing it to progress in severity. If it is not treated, it turns into periodontitis, which destroys the supporting structures of your teeth. Over time, it can lead to tooth loss. Although the outcome without treatment is bleak, your dentist can stop the infection and rehabilitate your smile. Advanced stages of gum disease require a more aggressive treatment plan. Not only does the infection need treated but also the damage it has caused. To begin the process, a procedure known as scaling and root planing is used to remove the buildup from the roots of your teeth and smooths them to prevent bacteria from gathering. It is not uncommon for antibiotic therapy to be needed as well. A comfortable Perio Tray is used at home to deliver medication in between dental appointments. A special sealing system allows the medication to reach below the gums by wearing the tray for a few minutes each day. This helps to fight the infection in a way your toothbrush and floss cannot accomplish. With daily application, disease-causing bacteria is kept at bay to allow your gum tissue to heal. Not only does this help to treat the infection, but it also provides maintenance to prevent it from reoccurring. 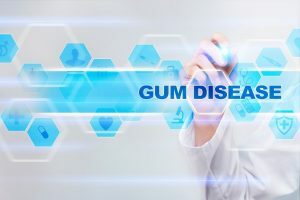 A soft tissue laser targets the diseased tissue to remove bacteria and close pockets in the gums. It allows the tissue to reattach to your teeth. Periodontal disease can cause gum recession. If too much of the roots are exposed, gum grafting is needed to cover them. Severe cases of gum disease can cause your jawbone to deteriorate. If the damage is extensive, bone grafting may be needed to improve its density. If tooth loss has occurred, the empty spaces in your smile will need to be filled with dental prosthetics, like a bridge, denture, or dental implant. To ensure the infection does not redevelop, periodontal maintenance is important. In addition to your home oral hygiene, your dentist will recommend a professional cleaning every 3 or 4 months. Gum disease is not a death sentence for your smile. You can overcome it with the right care from your dentist. Silver Creek Dentistry is a full-service practice. We treat complex oral health issues, like gum disease. If you need periodontal therapy, contact our office today to schedule a consultation.